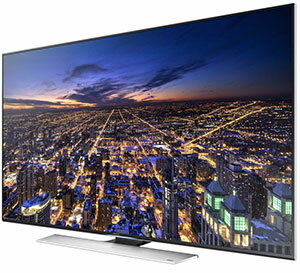 The Samsung HU8550 Series is designed for the more straitlaced aficionados of 4K UHD TVs. For the traditionalists who like their TV screens flat as a pancake - and just as thin - Samsung serves the HU8550 as a tribute to simpler times when TVs weren't curved like the ultramodern HU9000 shapely seductress. I'll admit to still preferring the 8550's up-against-the-wall profile, though I'm not immune to the siren call of the 9000's artful arc. Design aesthetics aside, the question is does a curved display improve the viewing experience? I say, not especially - better or worse. The picture quality of the 65-inch HU8550 4K display is very similar to the curved 65HU9000 that I reviewed last year, which was outstanding. (Editor's Note: Samsung makes six sizes of the HU8550 series of UHD TVs, starting at 50" and progressing through 55, 60, 65, 75 and the super-sized 85-inch TV. Since all of the models possess similar specifications, this review can apply to all of them. The video performance of the Samsung HU8550 is quite good, especially compared to other 2014 models. (The high-end 2015 4K TVs have definitely raised the bar.) With certain scenes, you can notice slight light leakage along the edges of the display. The two 10W speakers are aided by a pair of 10W woofers and their fuller range audio output is respectable but not up to the impact of this UHD screen. Samsung has incorporated almost all the goodies, Wi-Fi, 3D, Bluetooth, apps, voice recognition, screen mirroring, smart view, MHL and ARC support. About the only item missing from the HU8550 is a built-in camera for Skyping and controlling the TV by hand motions, the lack of which actually makes the TV easier to use. Over the years, Samsung has refined its interface to make accessing and watching content easier. The initial setup will quickly get you to a picture that won't require additional tweaking for most. But with such a full-featured TV, it will take some time and a bit of reading to reconnoiter all that the HU8550 has to offer. With 2014 models like the 65HU8550, prices can be a bit unpredictable. For example, as I type this, on the Samsung website this 65-inch TV lists at full MSRP of $4999, while the 75-inch HU8550 is on sale for $5499 (a $1500 discount). Even more enticing, the 65-inch curved HU9000 is slashed from $5999 to $3499. Then again, a quick search of online retailers found the 65HU8550 for under $2800. And if you just want to dip your toe in the 4K waters, plenty of fine performing, less expensive but less feature-packed UHD TVs are in the marketplace, like the Samsung 55-inch HU6840 on sale for $1200. As you can see, it pays to shop around.